This is where I will talk about my various projects. This includes home improvement, woodworking, tayloredtruth.com, robotics, and more. Sorry it's been so long since I posted. I'm sure there are hundreds of people that have been disappointed when they checked in every day. 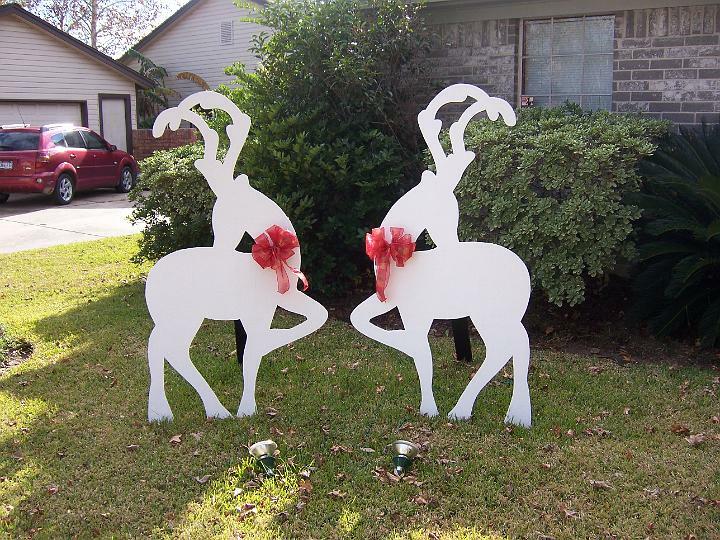 ;-) Anyway, the next project that E had me do was some reindeer for Christmas decorations. One of her coworkers has some like these and she stole the idea from her. These were pretty simple to make. I just used the jig saw to cut out the patterns and then sanded and we painted them. The only trick is that the fronts are covered in glitter as well as paint. If I remember right, we used spray paint until they were sufficiently covered and then rolled on one coat and while it was wet, sprinkled on the glitter. By the way, I have finally started working on my next project. It is a built-in desk for the nook in the kitchen. I'll be posting the work E and I did in the kitchen pretty soon so you'll be able to see the nook then.